I came to political consciousness with John F. Kennedy's magnificent 1961 Inaugural Address. It seemed the start of something fresh and exciting, and it was. "The torch has been passed to a new generation of Americans," said Kennedy, the first member of the Greatest Generation to hold the office. It was a moment of high idealism, the beginning of a decade that would see the birth of Medicare and Medicaid, the passage of monumental civil rights legislation and a new style of populist protest: the civil rights and antiwar marches, which presaged the struggles for gay and women's rights. 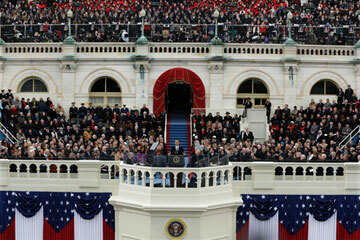 Fifty-two years later, Barack Obama's second Inaugural seemed a bookend to the Kennedy speech. It announced the final ratification of the progressive agenda launched by Kennedy and enacted by Lyndon Johnson, and the moral agenda proclaimed by Martin Luther King Jr. It closed the era of neo-imperial wars that began with Vietnam and ended with Iraq and Afghanistan. The turmoil that followed the terrorist attacks of 2001 and the economic crash of 2008 is on the wane as well. Indeed, the speech seemed more the end of something than a new beginning. There was unanimity, for once, among the Washington commentariat that it was a liberal speech--but, with the exception of climate change, this was not an agenda-setting address. It was a proclamation that the Reagan reaction to the events of the 1960s had come to an end. The welfare state would not be repealed. And while the fate of some social issues, like abortion rights and affirmative action, remains in doubt, equality has now been woven into the national fabric. The speech confirmed the November results: that a political party tethered to a white, regional, rural base no longer has the electoral firepower to govern the country. It was a confident speech. It marked a new reality in Washington: the ice is breaking. The President has demonstrated in recent weeks that he now has a working majority in the House of Representatives for many of his initiatives. Tax rates have been increased with Republican votes, for the first time in 20 years. Hurricane relief for the Northeast was passed with a majority of Democrats and a minority of Republicans. The debt-ceiling gimmick has been postponed, and perhaps shelved, by Republican leaders who see the handwriting on the wall. Gun control will be a difficult achievement, as the National Rifle Association sways a great many Democratic legislators, but immigration reform is likely to pass with a similar bipartisan majority--Democrats plus a wise minority of Republicans--as the tax increases did. On Fox News, the normally reasonable Chris Wallace called the speech an "unyielding, uncompromising espousal of a liberal agenda." Which would be true if we were living in 1961. But not so much now, unless you consider the preservation of Social Security and Medicare and the acknowledgment of civil rights as a starkly liberal vision. Most Americans see these things as ... reality. There was, in fact, a presidential nod toward the American "skepticism of central authority." We must, Obama said, "make the hard choices to reduce the cost of health care" and "we understand that outworn programs are inadequate to the needs of our time," and we must "remake our government, revamp our tax code, reform our schools." Those hardly seem brazen, partisan goals to me.